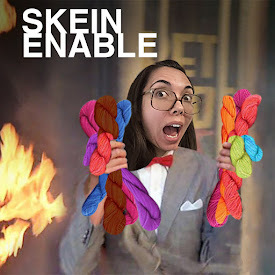 Skein Enable Podcast: Skein Enable Ep. 1 - Our first episode! Skein Enable Ep. 1 - Our first episode! In this episode, we introduce ourselves! A little bit shorter than our usual episodes will be. This episode is family friendly, but we can't promise that we will be in the future. We will denote if an episode is explicit. Michele is working on the Clincher scarf/bandanna by Ash Kearns out of Spun Right Round Snappy Socks in Trainyard. Her Ravelry page is here. She is also working on the Mielie Vest by Hilary Smith Callis out of Knit Picks Wool of the Andes Tweed in Forest Heather. Her Ravelry page is here. Jill just finished the Wendell Holmes shawl by Corrina Ferguson out of Wolle's Yarn Creations Color Changing Cotton in colorway Maroons II. Her Ravelry page is here. She is working on New Girl skirt by Allyson Dykhuizen out of Knit Picks Wool of the Andes Sport in Dove Heather and Sprinkle Heather. Her Ravelry page is here. She is knitting them for the Holla Knits! KAL. She previously made the Bombshell shorts for the KAL. We didn't talk about this in this episode, but we will in the future! We're working on iTunes and a Ravelry group. Stay tuned! Congrats on the podcast and thanks for the invite. Nice to hear from you. Keep up the good work!